I got an email from Ivan at Wattpad.com announcing his new mobile service, FeedM8. 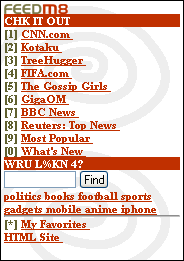 What it does is create a mobile site from an RSS feed. There are other services that do this. But the only ones I can recommend are Mowser (review), Winksite (review) and now FeedM8. I like these three because they are the only ones of the dozen or so I’ve tried that split long posts into mobile sized chunks and deliver clean and valid markup that works on almost any phone. The main differences between them are that Mowser and FeedM8 resize images while Winksite strips them. FeedM8’s image handling is particularly nice. Images display as small, fast loading thumbnails. Clicking a thumbnail gives choice of viewing the image in four different sizes. If you don’t want advertising on your site, only Winksite is ad-free. The other two put ads on your content but both will share the revenue with you. All three services deliver xhtml-mp, the current standard in mobile markup languages. FeedM8 and Winksite also support wml, an older standard that is all that some phones support. FeedM8 has some nice features for publishers, you can upload a logo for your pages and a description which appears in Feed9M’s site directory. There’s even a statistics page where you can track your traffic and ad revenue. Feed9M gives you a halfway decent url too, mine is fdm8.com/wapreview. Besides being a tool for publishers to create an instant mobile site, FeedM8 is also a mobile portal offering a wide selection of content, in the form of mobilized RSS feeds, from major sites like The Economist, Reuters, Business Week, GigaOm, The Times of India and BoingBoing. Users can bookmark any of these feeds or add their own to create a custom home page. This entry was posted in Portals, RSS Readers, Site Reviews by Dennis Bournique. Bookmark the permalink. 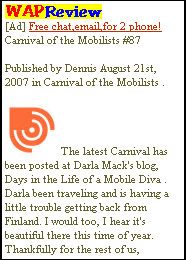 I will be adding a mobile feed to my blog. This is quite a handy tool. I will check it out.